With its gaping canyons, red sand beaches and soaring limestone cliffs, the rugged landscapes of the Cape Range National Park are a photographer’s dream. 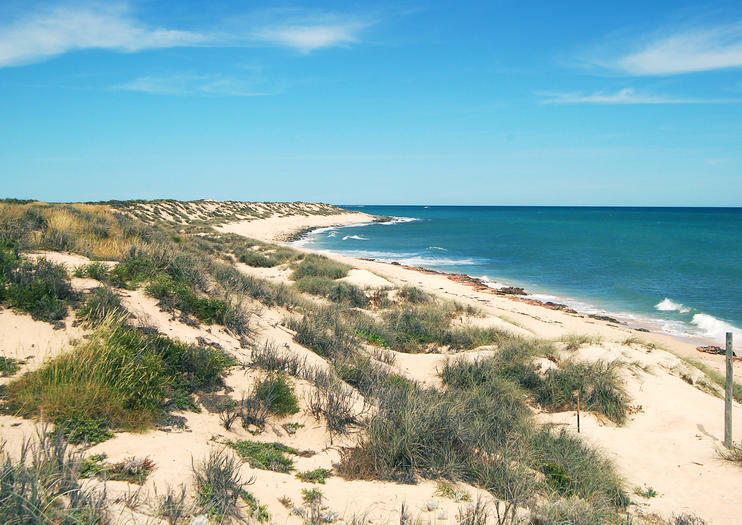 Stretching for 47,655 hectares along the North West Cape, the protected area includes more than 50km of sandy beaches and lies close to the famous Ningaloo Reef. Highlights for visitors include boat tours beneath the towering cliffs of Yardie Creek; swimming and snorkelling at Turquoise Bay or Oyster Stacks; bird watching at the Mangrove Bird Hide; or driving through the jaw-dropping scenery of Charles Knife Canyon or Shothold Canyon. Hiking, bushwalking and camping are also popular pastimes with marked trails like Mandu Mandu Gorge and the Badjirrajirra Loop Trail running through the steep gorges and hundreds of natural caves to explore along the way. The Cape Range National Park is also renowned for its varied wildlife with red kangaroos, wallaroos, emus and perenties frequently spotted; unique wildflowers like Sturt desert peas blooming throughout the summer; and a startling array of birds including mangrove fantails, mangrove whistlers and yellow white eyes. The Cape Range National Park is located 40km southwest of Exmouth on the North West Cape in Western Australia. Watching your budget needn’t mean missing out on adventure. Join a young, fun, small group and a guide for five epic nights of exploration as you travel from Perth to Exmouth. Tour the Pinnacles Desert, Kalbarri National Park, and Cape Range National Park; meet bottlenose dolphins on Monkey Mia Beach; and enjoy great discounts on watersports at Coral Bay, base for Ningaloo Reef. Package includes cool hostels and most meals. Thoroughly explore Australia's west coast and skip the hassle of driving on this seven-day all-inclusive trip. Starting in Perth, head to Exmouth, visiting Kalbarri National Park, Shark Bay, Ningaloo Reef, and more along the way before returning to Perth. Includes accommodation and meals.